The ingot and wafer represent the base and the most important part of the module manufacturing process. Unlike other module manufacturers, we carefully produce our own ingots and wafers in-house. Using the latest silicon technology and advanced ingot seeing, only the highest performing wafers are produced and used for JinkoSolar modules. Advanced ICP-MS (inductively coupled plasma mass spectrometry) and PL photoluminescense testing ensure the utmost wafer quality. JinkoSolar has state of the art, automated solar manufacturing facilities across the globe and an unblemished quality record. We ensure that each module shipped complies with the highest quality standards. We have taken extra steps to ensure that our modules are second to none with our rigorous in-house quality control standards. In addition to passing all standardized tests, we invite the world’s leading 3rd party institutes, including the Australian Solar Council Positive Quality Program, to audit our facilities, test our products, and help us refine our world class manufacturing process. The production process includes 52 tests which are performed on our modules before delivery to our customers. We perform Electroluminescence Tests on 100% of our cells prior to lamination and post lamination on 100% of our modules, assuring they have no micro-cracks. Our traceable quality system allows us to directly cross reference our solar cells with particular production parameters. Furthermore, each solar cell contains a code allowing us to answer questions about your JinkoSolar module even more efficiently. 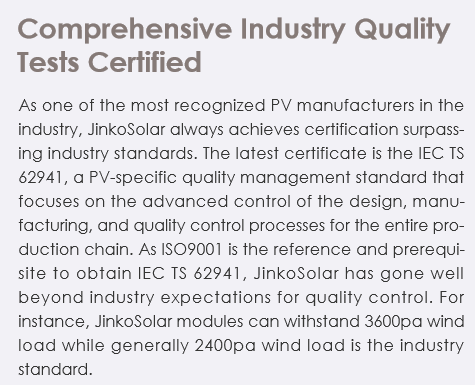 JinkoSolar provides customers with products made with raw materials of the highest standards to meet the reliability requirements of various kinds of installations and climate conditions. JinkoSolar has signed a strategic collaboration agreement with DuPont, one of the leading suppliers of advanced photovoltaic materials such as metallization pastes, and Tedlar backsheets, among others. This type of agreement reinforces JinkoSolar’s position of manufacturing high quality products with the best power outputs possible. The CSIRO and Choice Magazine have partnered to test the performance of a range of solar modules commonly purchased in the Australian market. After 12 months of testing at the CSIRO testing facility in Newcastle, JinkoSolar was one of just two module manufacturers to receive a score of excellent and above 90%. Our energy yield per 1000w was significantly above all our competitors. JinkoSolar received an outstanding result in the DNV-GL PV Module Reliability Scorecard Report 2017. 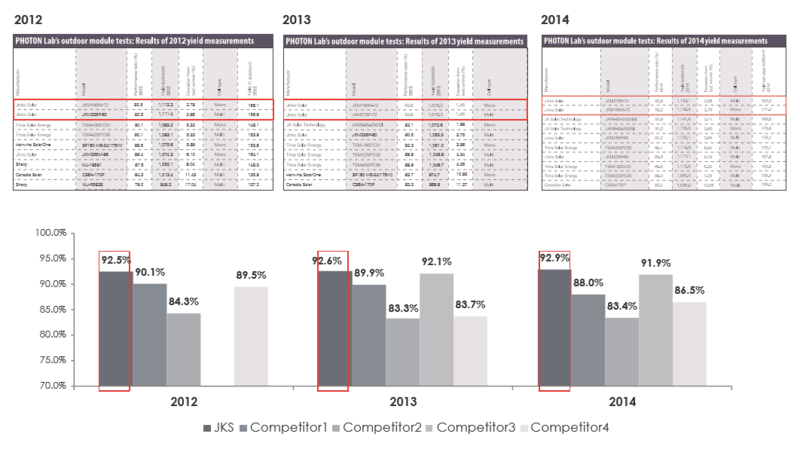 JinkoSolar was a top performer across all testing categories including thermal cycling, dynamic mechanical load, humidity freeze, damp heat, and PID test.